Finally!!!! 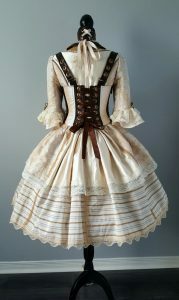 I have been dreaming about creating a steampunk Marie Antoinette costume for sooooo long! I will be at Ottawa Comiccon as a vendor/artist again this year and decided it was time to make my fantasy a reality and this is the result. 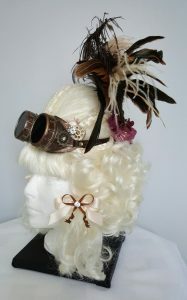 The goal was to see if I could combine one of my favourite iconic women of history with the much loved style of steampunk. It is a look and idea that I have not seen before. My online research also revealed that it a very rare combination and from what I did find, there is nothing out there such as what I have come up with. I am excited to reveal my character at Comiccon this weekend and see what kind of reception I garner. 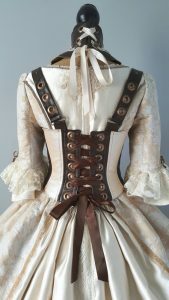 The whole look consists of above the knee bloomers, cage skirt, Marie Antoinette style bodice with attached full skirt, waist cincher with straps, neck corset and chest piece, Marie Antoinette style wig with steampunk elements and I will also be sporting fingerless lace gloves and a vintage fan. 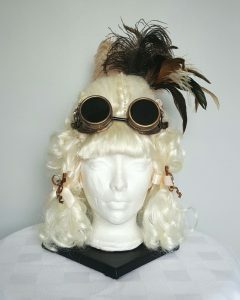 All of the clothing items were created by me from various patterns and the wig was an online purchase that has been re-worked by me hairstyle and décor wise. One thing to remember when creating lavish and dramatic costumes with many pieces and accessories is – visiting the ladies’ room! I never gave any thought to practicalities when letting my imagination and ideas run away with me for this particular outfit. 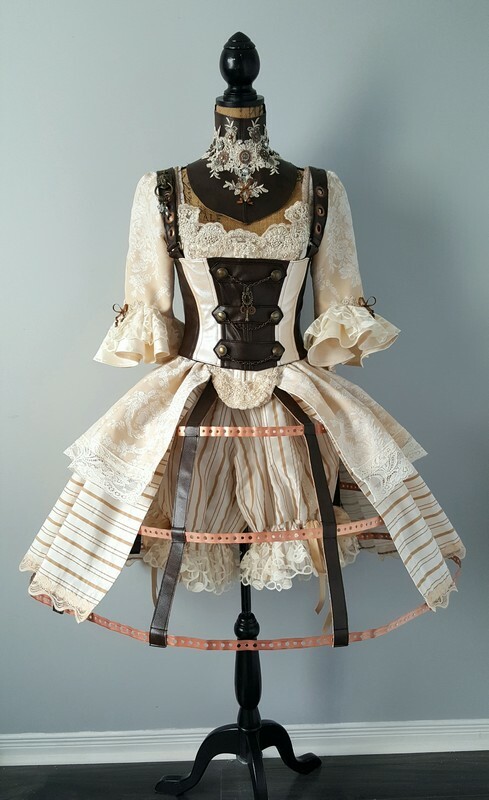 Luckily, the cage skirt is very flexible and I can just lift up all the copper rings and attached straps the way you would lift a normal skirt so this should solve that dilemma. 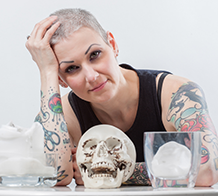 This is one of the negatives associated with creating wearable art – having to stop and think about restrictions or challenges for the wearer of your work, including myself. I learned quite a few new techniques throughout the process of creating each piece of this look. The goggles attached to the wig were originally generic black plastic welder’s goggles and came with a plain black elastic strap. I painted the goggles with a light coat of silver spray paint and once that was dry, applied two shades of rub and buff to the goggles to add more colour and accent. Rub and buff is an oil based product that comes in a small tube and you need very little – and I mean VERY LITTLE – of it for most projects. I used shades in a deep gold and burnt copper. Once the rub and buff is dry, you take a clean, soft cloth and, as the product name says, rub and buff your project with the cloth until you achieve a soft sheen and the colour becomes a bit more pronounced. I replaced the elastic strap with a new strap made of the same type of brown vegan leather used in the cage skirt and waist cincher. The addition of gears and some clear rhinestones completed the goggles’ makeover. I had also never made a cage skirt before. I researched different types, sizes and techniques from other costume makers online before deciding the best method for what I wanted to achieve. I found a pattern for making a cage skirt and used that to create the straps and perfect measurements for the three rings of my skirt. I knew I did not want to use typical cased boning for the rings. I wanted to incorporate metal, particularly in copper if possible, so off to the hardware store I went. With the help of a gentleman in the plumbing department, I found the perfect material – copper plumbing strapping with pre-punched holes in it that came in a roll. I needed two rolls for the three rings and a few screws and nuts to hold the rings together. My handy man of a husband helped me to cut the strapping to size. thread them through the openings in the straps and screw them together. 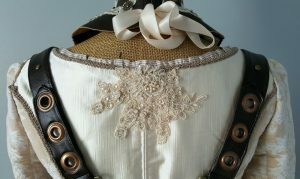 There is a waistband similar to a skirt that ties around the waist with ribbon ties. It is very light and as mentioned, actually very flexible for fitting through narrow spaces, on staircases and for washroom usage. The neck/chest piece was also a new accomplishment for me. The bodice of the dress ended up being cut much lower than anticipated and the large expanse of negative space and cleavage was not appropriate for attending Comiccon in a business capacity. I had intended to create a choker of sorts as an accessory anyways so I altered my idea and came up with something more unique. 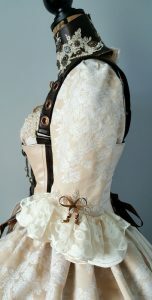 I used a pattern for an accessory contained in a costume pattern but, I changed it to fit more corset like around my neck and to sit further down on my chest above the bodice neckline. 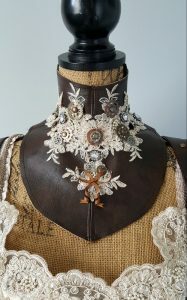 It was created using brown vegan leather, grommets and has been embellished with beaded lace appliques, gears and pieces from a deconstructed jewelled bracelet. I am super pleased with how this turned out. 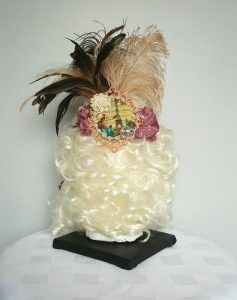 It incorporates steampunk and the lavish Marie Antoinette perfectly. It is hard and edgy with a feminine touch. Overall, I am proud of my commitment to this project and its execution. It is a perfect example of how imagination, planning, creative problem solving and fearlessness can be rewarded! This hat is the latest in my steampunk series of hats. I designed this one more with a man in mind but, it could work for the right woman as well. I was inspired by the Borg from Star Trek the Next Generation. 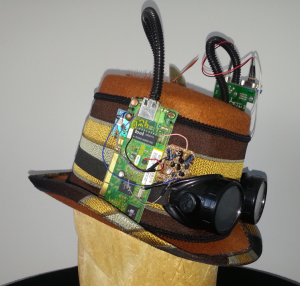 I used a bunch of old computer parts, circuits, coloured wire and some plastic tubing to embellish the hat. 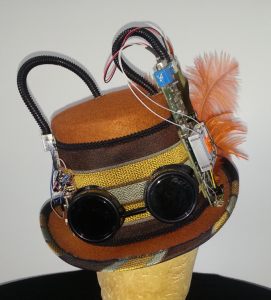 A pair of welding goggles adds that traditional steampunk element to the front of the hat. 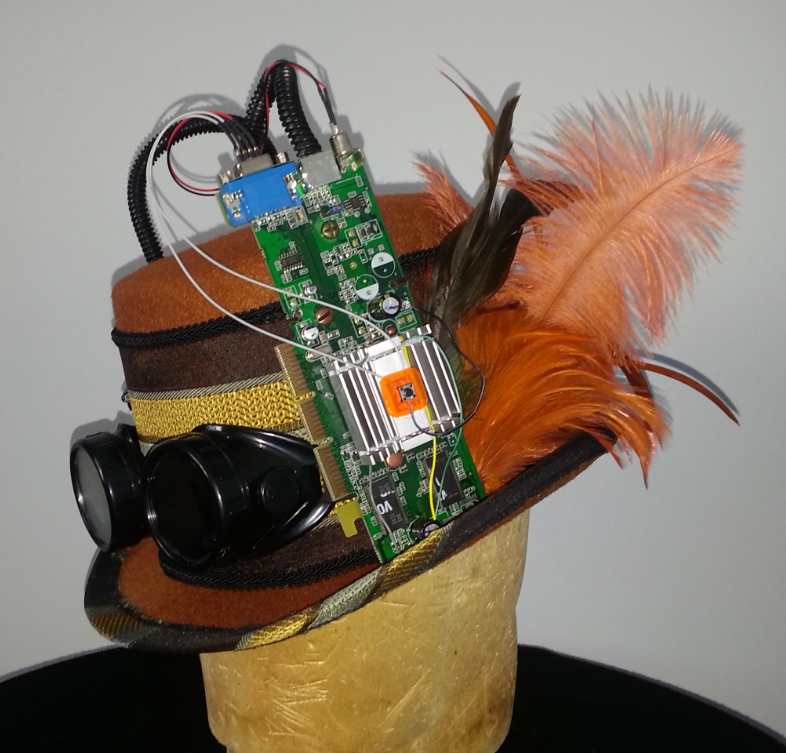 A fabric hat band, braided trim and a spray of burnt orange feathers provides a dose of elegance and panache to the finished piece. I am very happy with how this design came together and its new owner can be assured indeed of having the one and only hat of its kind in existence!